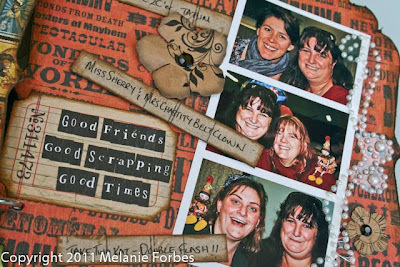 Welcome from all the way down under :) I am so glad you could join us for the Graphic 45 and Want2Scrap blog hop! 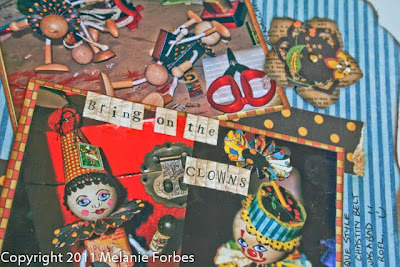 The hop kicked off earlier this week and runs until August 12th, 2011. So sorry if you visited earlier and this post wasn't up - not sure why blogger didn't do it as scheduled - I obviously didn't hit the right button lol. 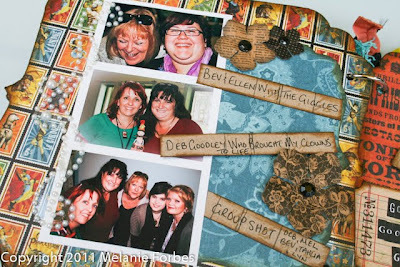 Today from the Want2Scrap Team, we have their design team member Terre Fry and from Graphic 45 join Gloria and Nancy and myself for some inspiring projects!! 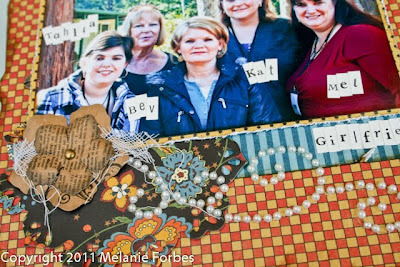 !Make sure that you stop by each designers' blog, the Graphic 45 Blog and Want2Scrap blog for your chance to win a bunch of amazing goodies! Want2Scrap and Graphic 45 will both be giving out two prizes. One prize on each of our blogs and one prize on each of our Facebook Pages. Want2Scrap will be giving out two $25 Gift Certificates and Graphic 45 will be giving out two prize packages valued over $25. 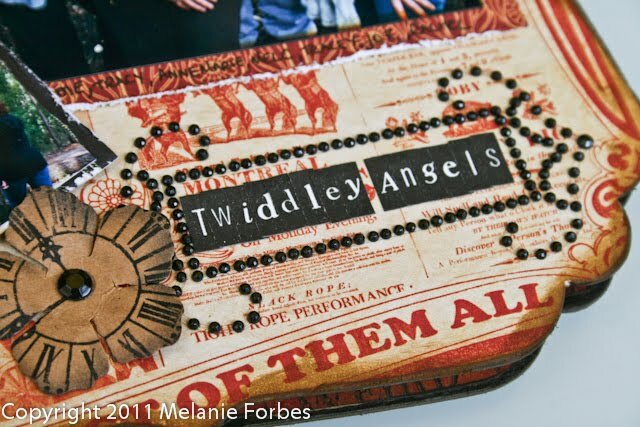 For the blog prize winner, we will pick a random person who comments on one of the designers' blog posts. For the Facebook prize winner, we will pick a random person who leaves a comment on our Facebook fanpage. 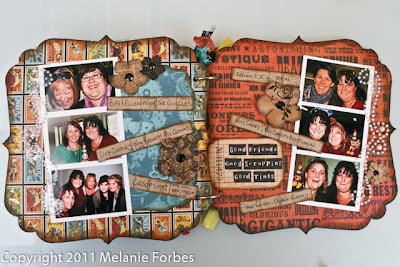 •	To add extra pages into album trace around scalloped chipboard page onto cardstock/transparency and cut out. 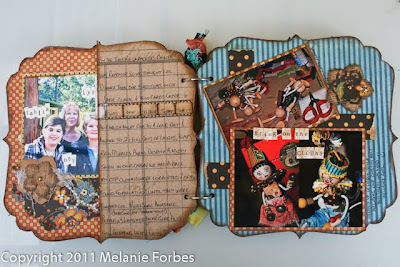 Page maybe folded in half and stuck together to give a different size page in album. oooooooooohhhhhh so cute - love the lolly and the knob on the cover - great touch !!! Your mini is too fun! I love all of the happy photos, too! i love this line. 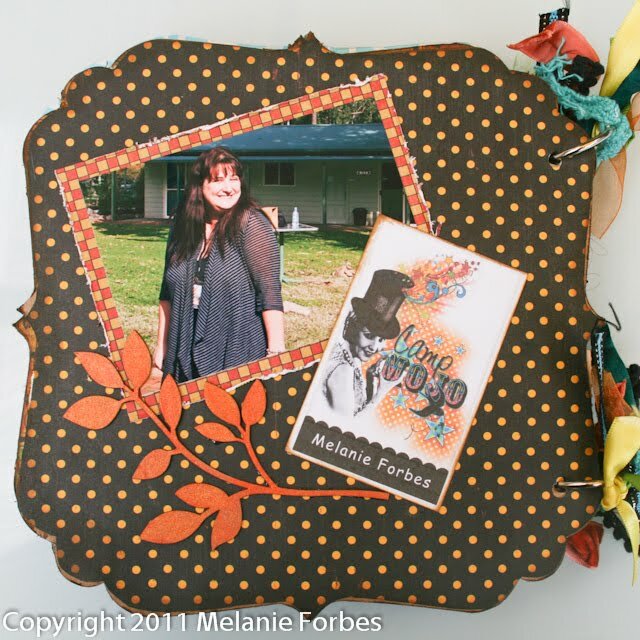 your album is very cool - great paper for such a fun occasion! What a gorgeous album! 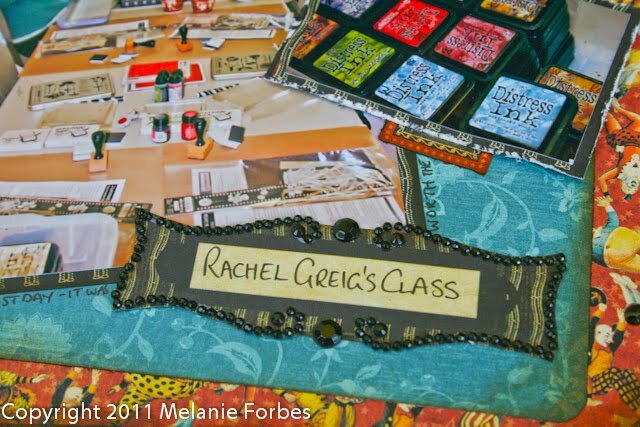 Love the papers, designs and all the different elements you incorporated into it! I love the theme and colors. Looks like you had a very fun time. Thanks for sharing your beautiful project. Looks stunning Mel. Didn't we have a great time. Can't wait to see the next project here !! Lovely album. 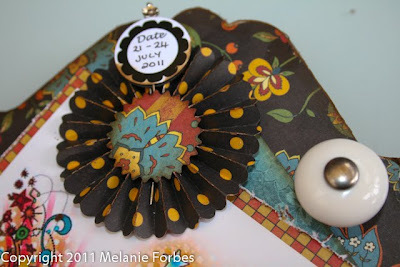 I like how you stamped on the metal staple flowers and the watch hands. Album flowed nicely and innovative ideas. Thank you! Loved all the colours in your album. It looks like your retreat was a great time to bond with other women! wow! The colors and well, everything is just wonderful. This album is stunning! 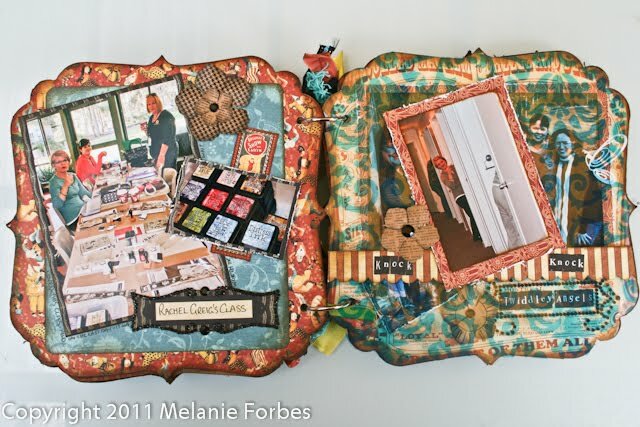 I love all your pages, the way you decorated them, the photos and colours! This is a very inspirational project. Thank you so muchfor sharing! This is really pretty luvin the colors! Thanks for sharing. Love the album. Looks like you had a great time. 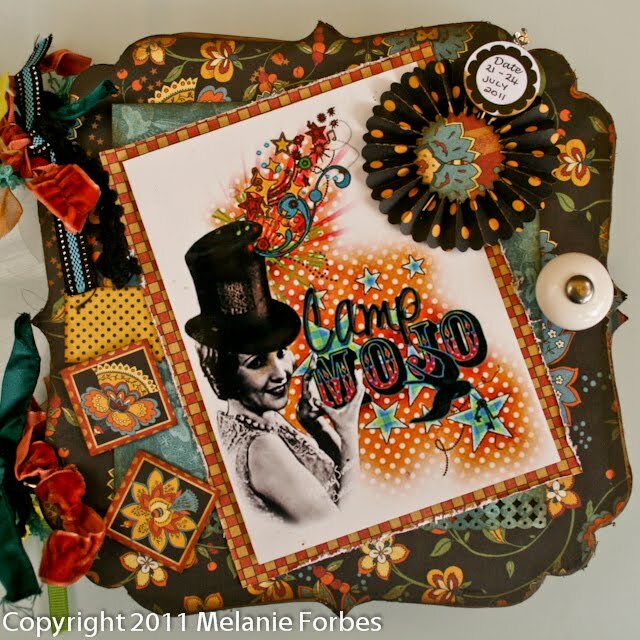 It's all about the photos and the way they are "showcased" with a show stopping Graphic 45 Le Cirque and accented with Want 2 Scrap. You made it FUN! What a great album! I love it! VERY NICE!!! I love your style!! Thanks for sharing!! 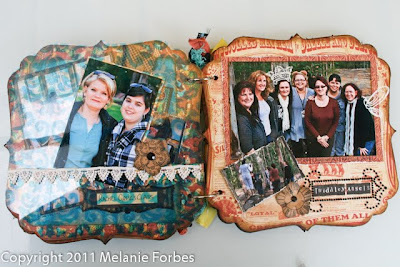 This is such a fun project, makes me wish I was at Camp Mojo too. Beautifull album! 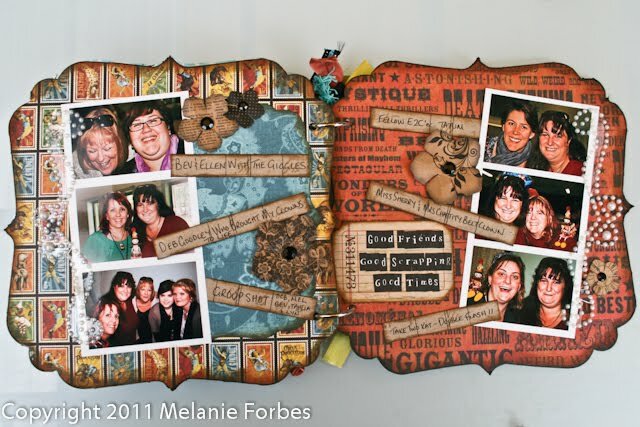 Love how you decorated all the pages! Mini albums have to one of my favourite projects. Thanks for all that creative inspiraion in your beautiful album. Absolutely amazing!!! I love everything about this amazing mini! What a fun album and what a fun time it looks like you all had. GEEEES I REALLY LOVE EVERY SINGLE PAGE OF YOUR ALBUM. BEAUTIFULLY DONE. THE COVER IS EXTREMELY ADORABLE. 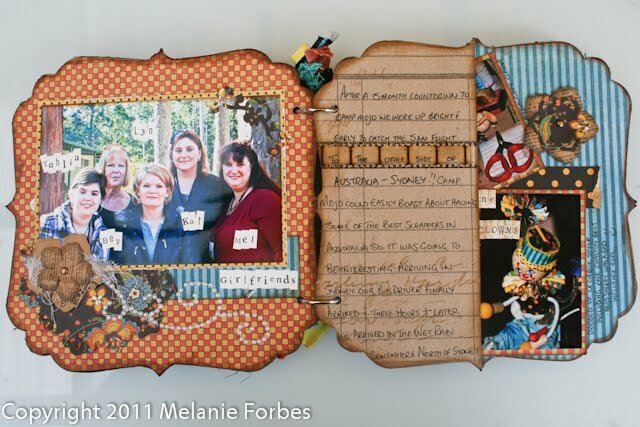 ALSO THE BINDING. this is soooo breathe-taking. you really pulled out all the characteristics of le cirque. GREAT JOB! I love this mini album and all the happy photos. Great paper!!! I love the mini! There is so much to look at. It makes a great gift for friends after spending a day doing something fun! Wouldn't they be surprised. Creative project. thanks for sharing. Melanie, this book is sooo fun!! Love all your color combo's and little "Mel" touches! Beautiful!! Love your mini-album. Thanks for sharing. I love mini's, you did a super job on this one. Thanks for sharing!! Your album is beautiful! 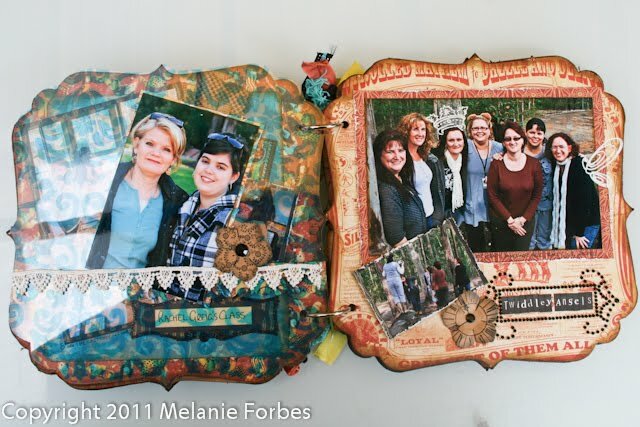 Love the papers and all the embellies! Thanks for the inspiration! Fun mini album! One to treasure! What a beautiful album. Love all the little details. I especially love the cover! I really really like your mini album. My style is similar to yours. I love all the decorations, the truth is that it has been lovely. Many kisses from the island of Menorca, Spain. Such a fun mini! I love that paper! Thanks for sharing what looks like such a fun time. What a wonderful memory album. Papers and embelishments were perfectly chosen. Your Mojo was definitely on high thru this project. Super projects -- love the bright colors. Awesome mini album. I tend to agree that I drag my feet when it comes to doing them but I usually love how they turn out. I haven't made a mini in ages. Looking at yours reminded me how much fun they are to make, and yours is so cute with that gorgeous paper ! I love making mini albums. I usually give them as gifts, no photos added. I think I will make this one for myself. I loved all the papers, flowers and bling that you added. Thanks for the inspiration. I live on the east coast of the US. Too far to travel to take one of your classes. My loss! Yowza! Your album is really, really cute. I love the colors, reminding me of fall and a jacket I have!Great job, Melanie. Wow! My first impression was COLOR! What a perfect way to scrap a scrap fest. I like your idea for adding more pages, too. I love mini albums! It's about all I do any more - to me it seems like I can get it done and have something to show. It holds my interest and I seem to lose focus on a big album. This one is amazing! I love the casual feel of it. Wow! You amaze me every time! This is over the top fab! Love you Mojo Game Album. So cool!! Love it. I must get busy and make one right away, I feel the urge to scrap after all this wonderful inspirations this week. Loved the detail to your pages, and the layouts didn't even look like traditional scrapbook layouts. Your mini-book is a real treasure; you've inspired me! Thanks. Gorgeous mini-that camp looks like it was so much fun!! 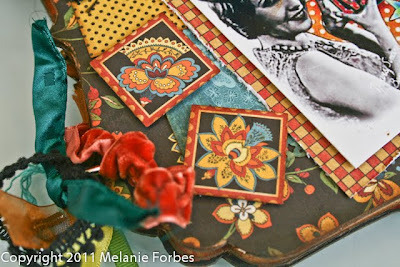 Incredible mini - it's just fabulous the colors, the photos and great papers! What a fun mini SB & great photos!!! Oh my goodness, this is totally stunning! I have not tried a mini yet, yours is beautiful. I need to get one of these. And that paper is fabulous! Oh, my what a mini! I just love Graphic 45 papers, have to. What an amazing job, you did. Terrific.